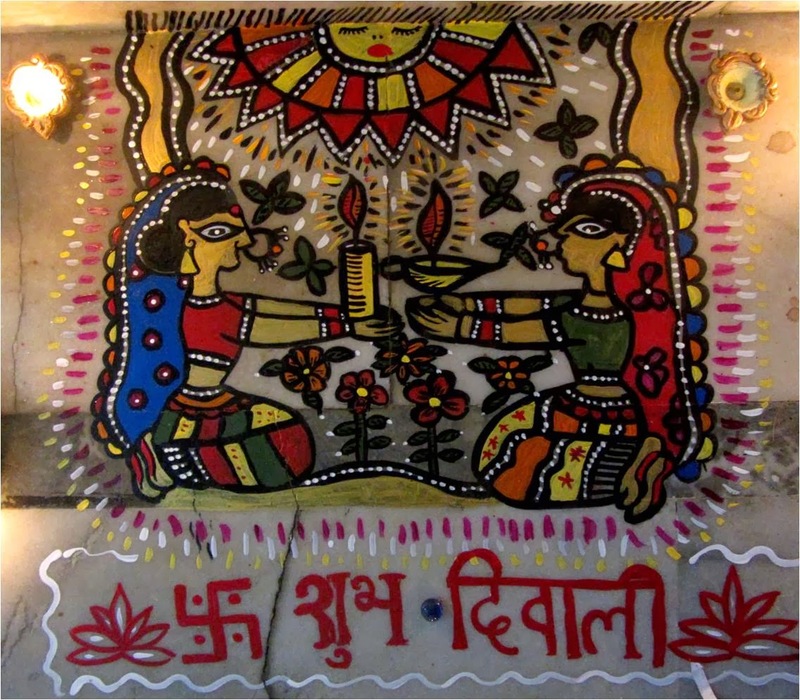 Although I am not aware of what Diwali means to the people in Bihar, what Madhubani drawing would they make and what symbols would they use, I made a painting about what Diwali means to me and how I see it. 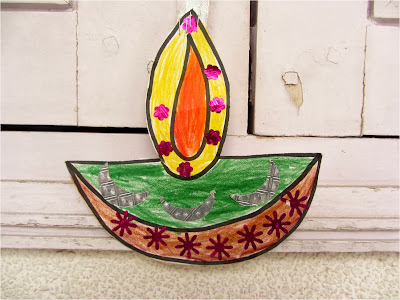 My daughter's diya made of paper. In my philosophy sun or moon represent a deity. It doesn't really matter if it's sun or moon, however they both are the bodies of cosmos and they both are "heavenly". They both provide some light. 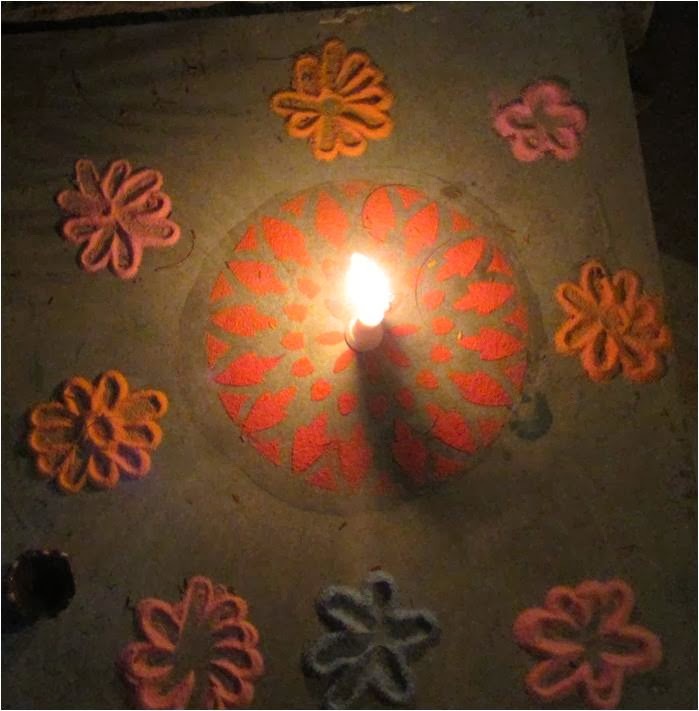 The moon gives us the nice cool light at night and the sun is what brings the whole nature to life. 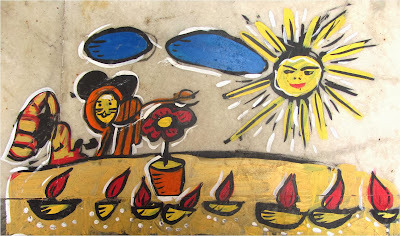 The sun is hot and active, the moon is cold and passive. The sun is warmth motherly giver and the moon is like an old enlightened Buddha, helping to contemplate "inner peace" and look within. This painting simply reflects a fragment from the Diwali celebrations, thinking about the light's victory over the darkness, all forms of light, the auspicious things, offering and gifting, meeting with friends and relatives, being at home, eating sweat things, decorating and enjoying the art, tradition and beauty together with the cosmic bodies. Just like we can feel that special spirit during Christmas when all streets are decorated and every home smells of a Christmas tree. 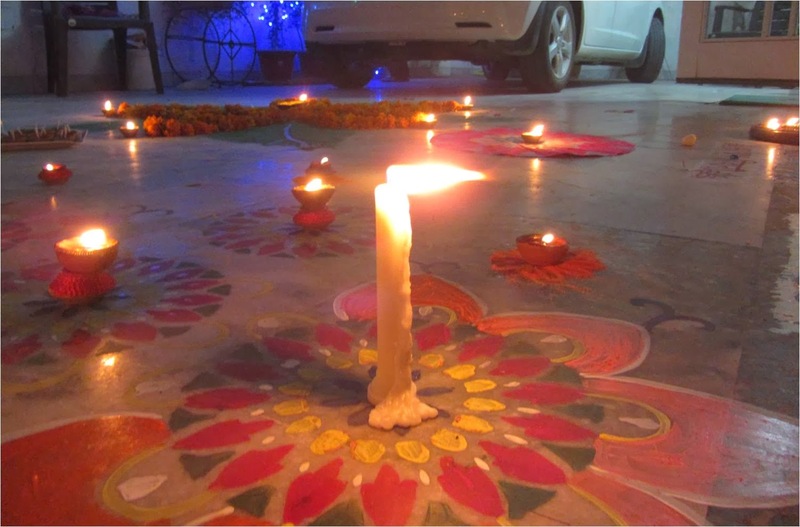 In the similar way we can feel that unearthly presence during Diwali, when, even those who live in red brick huts, erect few candles and light them. 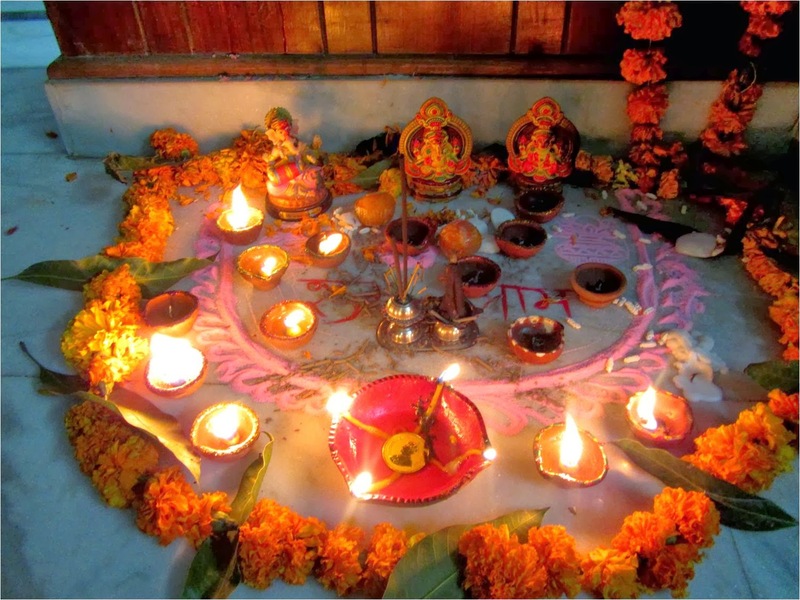 Diwali is the Indian Christmas and it's one of the most amazing festivals in the world. 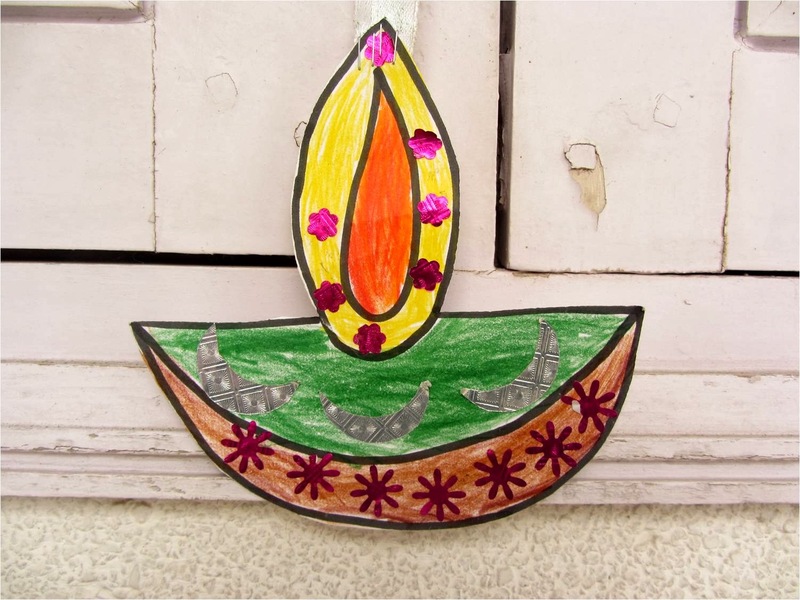 The usual way to decorate house during Diwali is not Madhubani painting though. It is rangoli. Rangoli is a way of decorating using rangoli powder. 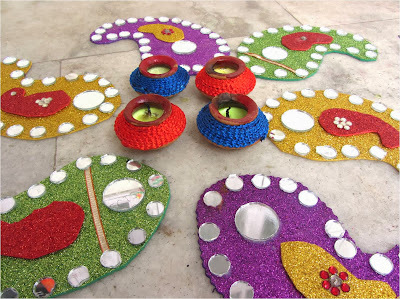 Various ornaments and designes can be made using this powder and it's usually done on the floor, near the entrance, near the door or stairs. The back of the house is rarely decorated. 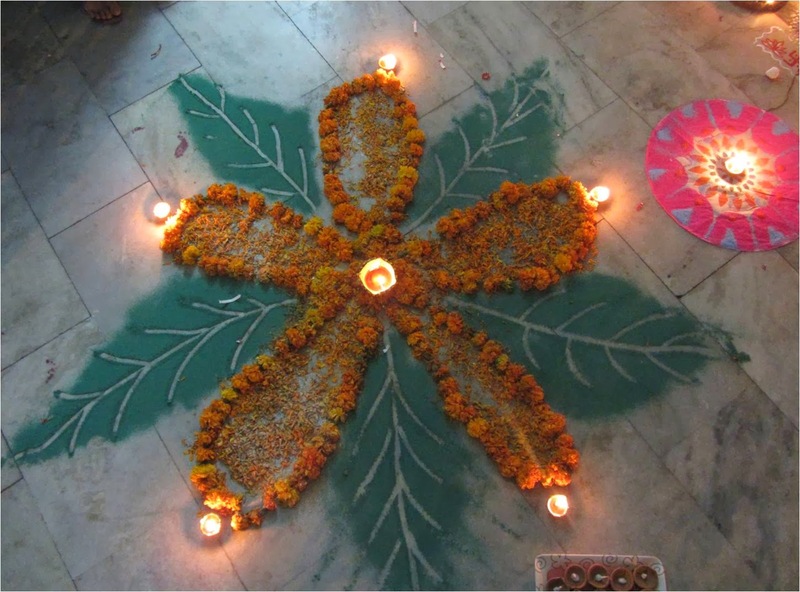 The Flower that My Mother-in-Law made out of marigold garland and its leaves, the green leaves are made of rangoli powder. 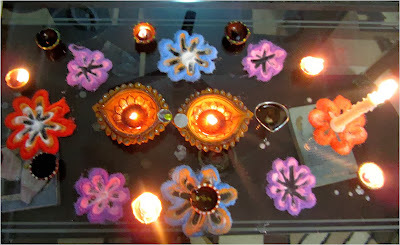 Diyas and rangoli flowers made of multicolored powder on the table inside the drawing room. Many painted flowers (using a paper shape) made using acrylic paint. My mother-in-law's mango shaped Diwali decorations - a typical design found in Indian folk art. Simple rangoli made of powder. 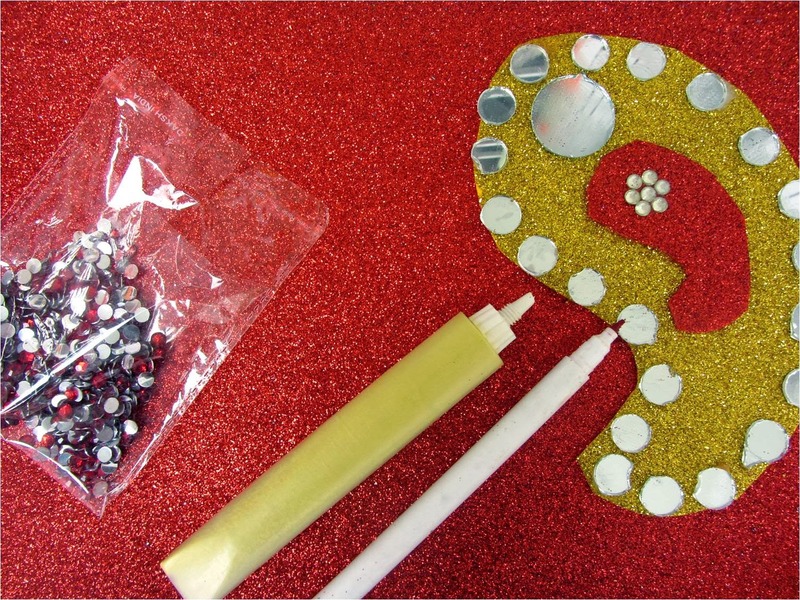 This is a combination of different mediums. 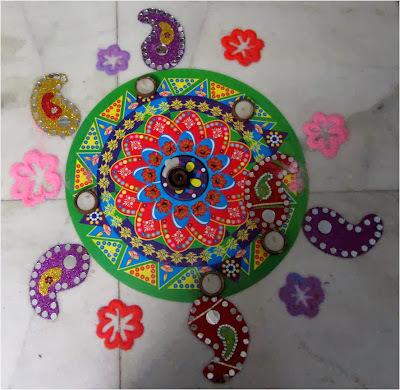 The green is a rangoli sticker with some clay diyas scattered around. On the sides there are read rangoli flowers and some mango shaped designs that my Mother-In-Law made herself using the glitter paper and mirrors. Your art is great but more then this your views about Sun and Moon are great and I pasted the paragraph in my favorite quotation with your name at the end. Very nice write up. 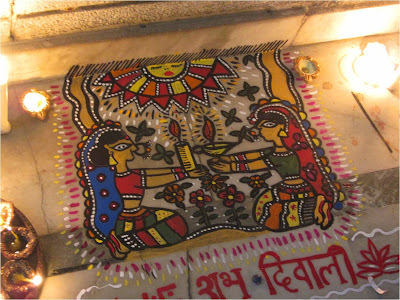 I was id my childhood days when our grannie used to paint these wonderful paintings. But alas! Now, no grannie. And no Madhubani paintings either. This really perturbed my feelings almost 2 years ago. 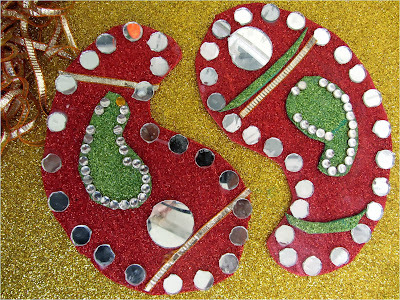 And I started www.emithilahaat.com to promote and preserve this art form. Thanks for sharing this wonderful write up.